Your bill is designed to be easy to read and understand. We've set out the information on your bill in clearly labelled sections, which all come together in an account summary on the front. It also shows your account details, the amount to pay and when to pay by, your usage information and graphs to help you compare your usage with previous bills and other households. 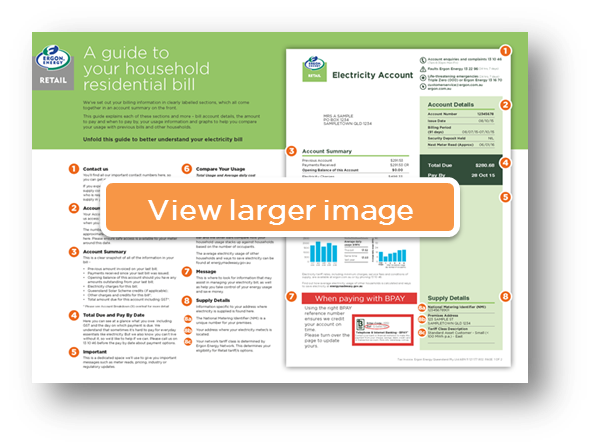 We've prepared a handy guide to your residential bill (PDF 1.1 mb) (click to enlarge) to help you find the information you need. You can also watch our video for a walking tour of the information provided in each section of your bill. Wondering how to navigate the newly updated Ergon Retail household residential bill? Here’s an overview to help you better understand your electricity bill. Account Details shows your account number, the bill issue date, billing period, and your approximate next meter read date. Have your account number handy if you need to call us as it’s a unique identifier to you which helps us access your information. Below, you can see a quick snapshot of your current total due and pay by date. And the total amount due for your account. Looking for more details about your account and the charges included in this bill? Turn to page 2 of your bill for your Account Breakdown. Here, you can see your charges broken down into sections, to help you understand how we’ve worked out your bill. Electricity Charges shows your meter number, previous and current meter readings, how much electricity you’ve used in kilowatt hours since your last reading, cents per kilowatt hour, the total dollar cost of the electricity, your daily supply service fees, and the number of days billed in the current period. If you have a solar PV system, under the Queensland Solar Scheme, you’ll see previous and current readings for your solar meter, and the amount credited to your account for the solar electricity your meter generated during this billing period. There’s also a section for any other charges and credits to your current bill. This is where the “meter services charge” introduced by the Australian Energy Regulator will appear. Lastly in this section, you can see any payments you’ve made since your last bill. At the bottom of page 2, you’ll find a section titled Payment Options, which includes a range of options for you to find one that suits your lifestyle and needs. You’ll also find the reference number required for each payment option, including your up-to-date BPAY reference number so please check this before your next payment.